To ensure the safe and enjoyable usage of trail for all users, before you start riding please ensure that you are well versed in these before heading out! Mountain bikers should wear a helmet when riding. It is also recommended to bring a basic first aid kit along with you when riding, and to carry a mobile phone with you at all times. Remain contactable at all times, and always ride with someone. If that is not possible, let someone know when you're out riding along. Do exercise responsibility for yourself and your loved ones as mountain biking is a relatively risky sport. Our community does not need any bad publicity from mountain biking related injuries because of irresponsible riders who cannot take care of themselves. Remember it is your life, live to ride another day. When overtaking other mountain bikers, pre warn the biker of your presence by calling out "Bike!" Thereafter when you are ready to over take the biker, indicate which side you are overtaking from by calling out " Passing out on your right/left ! " If you are going downnhill, please give way to mountain bikers riding uphill. Nothing is worse than losing momentum when going uphill. 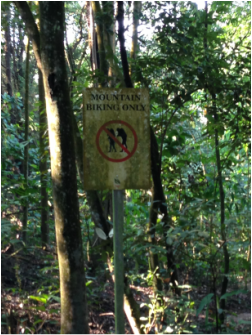 Our mountain biking trails are in the midst of some very fragile forests, and we don't need our trail access restricted because mountain bikers are straying off the trails or building new option lines in existing trails without permission. Yes, we all know of the really nice and 'fine' trails out there which really make for some great riding. But there are some good reasons why we shouldn't ride on some of these trails, and we promise that MBASG is doing everything we can to champion for some of these trails to be opened up for mountain biking. While riding on trails do try not to excessively brake while descending. If necessary do place more power on the front brake in comparison to the rear. This helps preserve the integrity of our trails by reducing the wear and tear to the trail. Excessive braking on the rear wheel increases drag profile of a bike. Trail users should ensure what nothing should be left on the trails besides the occasional tire print ( and if super necessary, foot prints ). The number of plastic packets one takes into the trail should equal or exceed the number that one takes out. As responsible trail users MBASG endorses trail cleaning by all riders. If you see trash on the trail, please take a minute of your time by clearing the litter to make the trail a better place for all users! As trail users, we do not own the trails. The trails are home to a myriad of animal species and they belong at home on the trail. Trail users should refrain from removing these animals from their natural habitats. 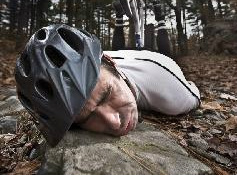 In addition Mountain bikers shall be conscious of the line that is taken. Please refrain from riding over wildlife if possible. 2. Alert the hiker to your presence if you are approaching them from behind. 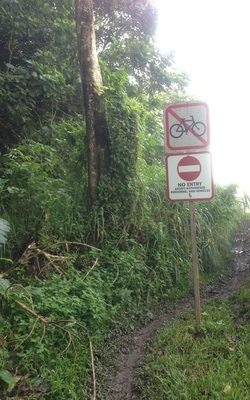 Yes we know it's a biking trail, and hikers not supposed to be there. They're slowing you on your hot lap, but good interactions mean more trail possibilities as MBASG is asking for biking access on hiking trails! There are also possible multi-use trails for all recreational users coming our way and good interactions are the beginning to more trails! Most of Singapore's trails aren't located near residential areas, with the exception of Bukit Timah Mountain Biking Trail. While riding the BT MTB Trail, please exercise consideration not to make excessive noises during the later hours of the day.